Apple added a few new features to Photos beta in a recent update to its iCloud.com hub, bringing manual image zoom controls and email sharing capabilities to the iOS-connected Web app. With the latest Photos beta for iCloud.com, users will see a new slider element for controlling image zoom levels appear in the top left-hand corner of their browser window. The same zooming functions can be performed by pressing the Option key and scrolling up or down on a trackpad or Magic Mouse. 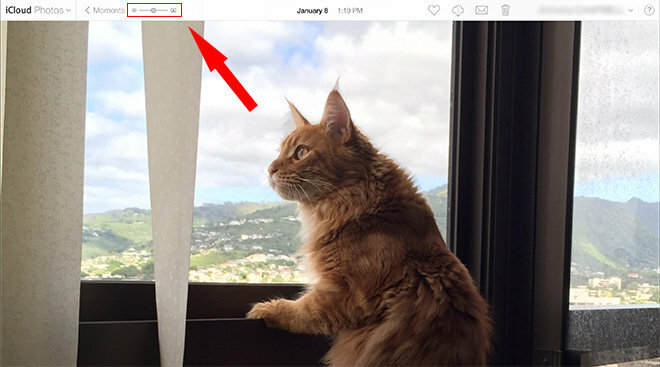 In addition, Photos beta now allows sharing through email, a feature previously restricted to iOS and Mac devices. When viewing single images, the option appears as an envelope icon in the upper right-hand corner, next to the favorite, download and trash buttons. Multiple pictures can be shared through the Select Photos feature while in Moments or Album views. Clicking the email sharing icon opens a new iCloud Mail browser window with the selected photo or photos already attached. The usual attachment size information is also displayed, noting how much overhead is left of iCloud's 20MB sending limit. 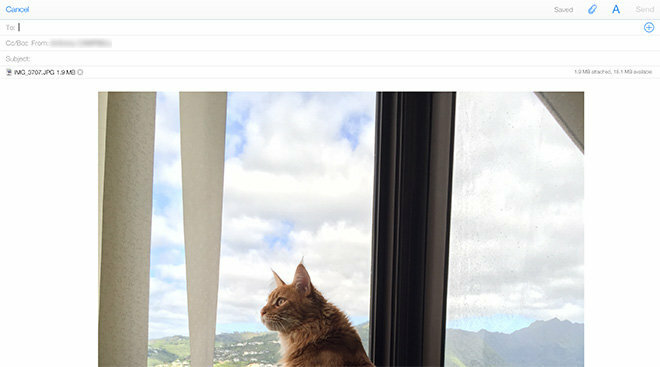 The new image zoom and email sharing options come as part of Apple's continual effort to build out a more comprehensive Photos platform. For example, a feature that lets users upload pictures directly to their iCloud account from a Web browser debuted in November. iCloud Photos and its iCloud Photo Library counterpart on iOS 8 still carry beta designations. The iCloud.com version is limited to JPEG image uploads and does not yet support other formats or video, though those functions may become available when Apple launches the upcoming Photos app for OS X Yosemite. Promised some time in early 2015, "Photos for OS X" will supposedly merge the best features of Apple's iPhoto and Aperture apps. The company halted further development of its consumer and professional image editing programs last summer, noting the upcoming Photos app will bake in unique features from both including image search, editing, effects, and plugins.